I decided to publish a separate income report for my new blog (momshealth.co) as it made quite an exceptional income in the 4th month since I bought the domain name and set up the hosting. 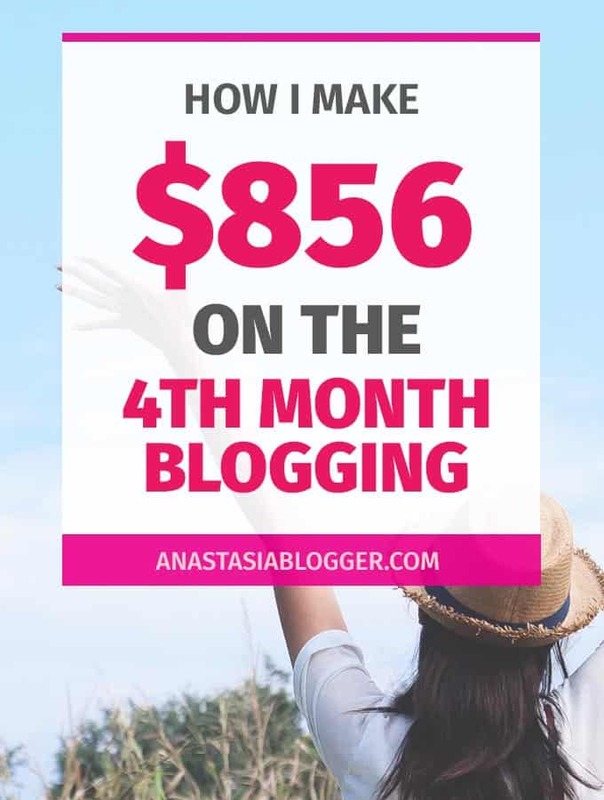 The new (my second) blog made $856 on the 4th month and all this was only possible because of my free (organic) Pinterest traffic! From this post, you’ll find out exactly how I made it. I guess, not everyone reading this post knows who I am, why I run two blogs and what they are about. I’ll make this story short for you. I wanted to test my Pinterest strategies on a brand-new blog and see how fast I could grow traffic knowing all that I learned in the first year of blogging. This worked perfectly well as in just 2.5 months my new blog was getting 74,000 monthly pageviews traffic. Plus, I wanted to have a blog for mom- and health-related posts which didn’t fit much anastasiablogger.com blog. If you are about to start a blog and thinking, what your main focus should be for the first year – Google, Instagram, Facebook, paid ads (some newbies even think of this option!). My answer is: focus on Pinterest! Mediavine ads – $493.17 (the switch from Adsense happened on May 9, so the income from Mediavine doesn’t represent the full month). Traffic first – income will follow. Probably you have seen some “pro” bloggers who claim that traffic is not what grows your income, but I don’t believe in this! In any niche, you need an audience first and then you can think about sales funnels and other fancy stuff to monetize your blog. I keep driving over 90% of all my traffic from Pinterest – it’s organic and free traffic. If you are still in doubts whether it’s worth investing your time and learning about Pinterest SEO, just keep in mind that my second blog has grown from 0 to 74,000 pageviews/mo in less than 90 days. I made an overview of my blogging income and traffic for the first blog and compared with the second blog. I realized that I could have reached the first $1000/mo income much faster if I didn’t start blogging about blogging. I was ignoring for too long the opportunity of driving Pinterest traffic to non-blogging content. Applying to Mediavine became my objective only in about 7-8 months blogging and as a result, I received my first decent ad income ($1440) only on 11th month since I started the first blog. You might also want to see my income report for May 2018 for both blogs and find out how I made $4000 in one month! First of all, thank you for sharing everything that you share. It is inspiring for people like me, who dream of doing something similar one day! I love your blog and followed your journey for a while now. I wanted to ask you if you could clarify (or expand) on the point where you say you wish you didn’t focus on blogging about blogging from the start. Is this because you think this niche is becoming a little difficult to get into? Or you found there is more demand for blog posts about other things, like health/weight loss niche? Hi, Val! This niche is saturated but it doesn’t mean you can’t find your place in it. I actually try to monetize with courses like my Pinterest course. The reason I regret I didn’t focus on other niches from starters is because you can’t get that much traffic from Pinterest in blogging about blogging niche to monetize it with ads. Also, it’s very difficult to establish your authority as a blogging expert and sell courses or other products to beginner bloggers if you don’t have some impressive numbers to show. And it’s hard to get those impressive numbers if you are competing in blogging for blogging niche simply because there are not as many people who want to be bloggers compared to your potential audience in health/weight loss/parenting/recipes niches.